So if you checked out my last eDesign (of course you did...why wouldn't you...silly not to...) featuring the Creamy Eclectic Kitchen and that fabulous backsplash tile, then I'm sure you've been eagerly anticipating this post on decorative tile. I know some of you are thinking it might be too busy or make your space feel too "old fashioned", but most of the new patterns easily morph from vintage to contemporary to retro. When used in small doses or in inventive ways these tiles are easily the focal point and can really freshen a space. 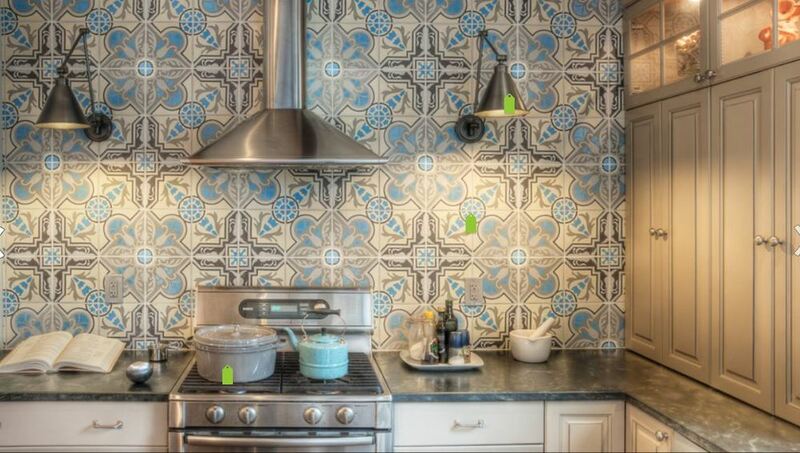 OK, full disclosure here, these tiles can get pretty pricey so a full wall or backsplash may not be an option for some. For those of us in the "some" category, using decorative tile as an accent or just behind the stove (as suggested in my Creamy Eclectic Kitchen eDesign) still packs a punch. Obviously this tile doesn't need to be restricted to the kitchen, they're great on a floor or in the bathroom and would be an unexpected punch around the fireplace or on your stair risers. What are some of your creative ideas? Since I can't decide on which I like best, I think I'll go for the quilted look!